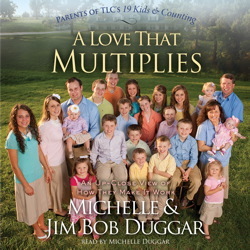 In A Love that Multiplies, Michelle and Jim Bob Duggar share the principles they have relied upon to get them through the challenges of raising nineteen children, as well as the character qualities they teach their kids and try to model themselves. The world continues to be amazed by their nineteen well-groomed, well-behaved, well-schooled children and their home life, which focuses on family, financial responsibility, fun—and most importantly, faith. The Duggars show how parents can succeed whether they’re rearing a single child or several.